Providing Industry Developments, Contamination Control & Advice For Maintaining Your Cleanroom. We understand what it is like when all the standard furniture catalogues you are looking through are not quite what you are looking for. This exercise can be frustrating and time consuming. It is also important to fully understand the importance of good design and quality manufacture when dealing with controlled environments. Much off the shelf furniture is not of adequate quality for use in a cleanroom environment. This understanding comes from our Managing Directors experience in the design and construction of many cleanrooms and laboratory environments. Fully welded stainless steel construction for cleanroom, laboratory and food production areas. These products are designed and manufactured with quality and strength in mind. Ideal for sterile and hygienic environments, they provide a hygienic use within cleanroom and laboratory environments. 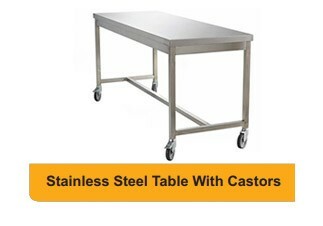 Our stainless steel tables can be manufactured from two grades of stainless steel. 304 grade stainless steel, or higher quality 316 grade. For all our fully welded tables we make sure all welds are ground and polished to minimise contamination risk. Each leg is fitted with plastic adjustable feet which are used to even up the level on un-even floor surfaces. If the details that you see here do not meet your exact requirements, we are more than happy to produce bespoke furniture and provide you with a quotation. This can include virtually any option, including perforated worktop to fully serviced workstations. 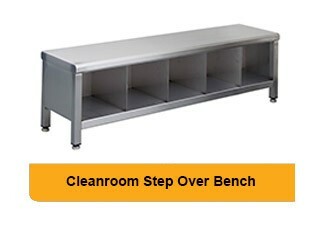 Our stainless steel step over bench is cleverly designed as it is compact, hygienic and robust. Moreover, the bench can be built with one big convenient storage compartment multiple small compartments. The stainless steel bench is manufactured from 304 or 316 grade stainless steel or trespa. Again many bespoke options are available with our step over benches. Just ask and we can assist you. We offer high quality two and three tier trolleys with swivel and lock castors for ease and reliability of use. Reliability & hygiene also plays a part in why we recommend robust, fully welded cleanroom trolleys. Trolleys can also be ordered for self assembly at a lower cost, lower quality option. 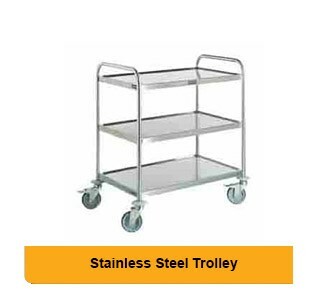 Our high quality Stainless Steel Trolleys are ideal for transporting equipment in cleanrooms, laboratories and other environments that require a focus on hygiene levels. 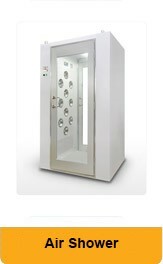 Air showers are specialized enclosed chambers which are incorporated as entryways to cleanrooms and other controlled environments to reduce particle contamination. Air showers utilize high pressure, HEPA or ULPA filtered air to remove dust, fibrous lint and other contaminants from personnel or object surfaces. The forceful “cleansing” of surfaces prior to entering clean environments reduces the number of airborne particulates introduced. When properly incorporated into cleanroom design, air showers provide an ISO classified transition to ensure the cleanliness of the classified cleanroom. Air showers are typically placed between a gowning area and cleanroom. We can design and build to your exact requirements. 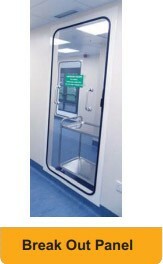 The emergency escape panel, which is also know as the breakout panel, provides a quick escape from a cleanroom. Also, provide the added benefit of acting as a window that can be easily removed for equipment access route during planned shut downs. The breakout panel is quick to remove, it will take around 2 seconds to fully remove the light weight panel. To remove the acrylic sheet the operative takes the stainless steel pull handle fitted to the inner rubber and pulls out the inner rubber from around the acrylic panel. This makes the acrylic panel loose in the main rubber gasket. The operative now holds the two stainless steel pull handles and pulls the acrylic panel out of the gasket. The breakout panel is available with 1.6mm thick frame, which will either be in stainless steel or polyester powder coat finish. The frame has high quality acrylics sheet fitted by a rubber gasket. We will work with you and design the furniture you want and best of all this service is Free! We will produce CAD drawings of your requirements. When you are happy with the design we will manufacture and deliver the furniture or bespoke fabrication for you. So, if you are looking for bespoke tables, benches, workstations, trolleys, pass through hatches, air showers, step over benches, we can help with almost anything. Are you using the correct grade of stainless steel? Click Here to learn if you are using the right grade of stainless steel for your controlled environment. Click Here to read our bespoke furniture page for more detail. ISO14644 Update – What does it mean for your Cleanroom? Disposable Cleanroom Gloves – What Are The Choices? What Are The Changes To The PPE Directive 2016? ISO 9001:2015 – Why Was The Standard Recently Revised?